Christopher Samuel Youd died on 3 February, aged 89, of complications from bladder cancer. To science fiction fans around the world, he was better known by the pen name John Christopher. It was as Christopher that he wrote his most enduring works, including The Tripods trilogy and The Death of Grass. Youd was born in Lancashire, England, in 1922, and had his first book, The Winter Swan, published in 1949 under the name Samuel Youd. But it was not until his 1956 science fiction novel, The Death of Grass, that he was able to make writing his full-time career. He used the pen name, John Christopher, for this novel and other works of science fiction, including the YA trilogy that he is best remembered for — The Tripods. Although it is his science fiction novels, particularly those for teenagers, that earned him the greatest success, he continued to write a variety of novels. He was rather prolific, often writing four novels a year. Maybe that’s why he used so many pen names. As well as Samuel Youd and John Christopher, he also wrote under the names of Stanley Winchester, Hilary Ford, William Godfrey, William Vine, Peter Graaf, Peter Nichols, and Anthony Rye. His final novel, written under the name of John Christopher, was Bad Dream, published in 2003. I’m sad that John Christopher is gone. His books had a great impact and influence on me as a teenager. Along with Eleanor Cameron and Robert A Heinlein, he is responsible for my interest in reading science fiction. I discovered Christopher’s books as a young teenager in the early 1980s. It all started with The Tripods trilogy (The White Mountains; The City of Gold and Lead; and The Pool of Fire). I cannot explain to you how much I LOVED these books as kid. I read them many times over, I obsessively watched and recorded the tv series that was based on them, and I even collected different editions of the books. I re-read them as an adult in 2010 and was very happy to find that I still enjoyed them (and I blogged about it — “Tripods Rule!”). After I finished reading The Pool of Fire for the first time as a teen, I raced out to find other books by Christopher. And so I ended up reading Wild Jack, The Lotus Caves and The Guardians, all of which I liked a great deal, before discovering a new trilogy that I would end up loving almost as much as The Tripods. English teenager, Simon, and his annoying American cousin, Brad, find themselves swallowed up by a mysterious ball of fire and transported into an alternative timeline where the Roman Empire had never fallen. In the first book, Fireball, they come into conflict with the Roman authorities and with the Christian Church. In the second book, New Found Land, they sail to America, where the Aztec civilization is still going strong. And then they’re off to China in the final book, Dragon Dance. 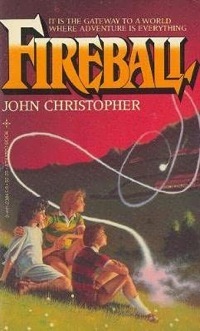 I’ve not read the Fireball trilogy since I was a teenager. But Christopher’s death has inspired me to put these three books onto my must re-read pile. And, since I’ve never read any of his adult novels, I think I might seek out one or two of those. Goodbye John, Samuel, Stanley, Hilary, William, Peter and Anthony — many names, many books and so much inspiration over the years. Rest In Peace. I too read & loved The Tripods when I was at school, I hadn’t realised he had written so much else under so many names. I will have to keep an eye out for them, as well as try to get Daughter the Elder to read The Tripods. Yes, Fraser, he wrote A LOT! Would be very interested to hear what Daughter the Elder thinks of The Tripods, if she does end up reading them. They are a bit ‘old fashioned’ and have so few female characters. Next Next post: Mugshot or marriage material?